The Bambino is a lovely little hookah from Mya Saray at only 11 inches tall. 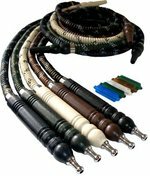 It is a simple, delicately designed single hose hookah with style and functionality in mind. 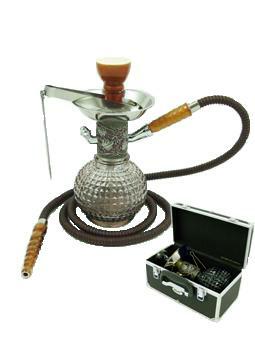 It may be used as soon as unboxed, granted you have the shisha and charcoals. The design on this tiny hookahs stem is absolutely gorgeous with a fully textured, full cover pattern that creates a sense of depth and texture. The glass vase of the Bambino matches this detail with a radial debossed pattern set within the heavy duty glass and is available in a wide selection of color options. The Bambino is sure to impress, even at its size! Multi Hose Capability This model may not convert into a Multiple Hose Hookah.